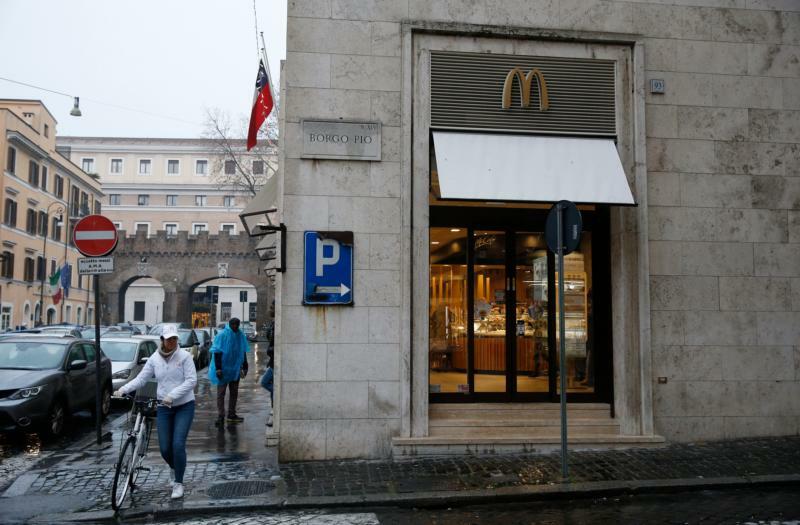 VATICAN CITY (CNS) — While the controversial opening of a McDonald’s near the Vatican may not have all local residents singing, “I’m lovin’ it,” the popular fast food chain is trying to do its part in the neighborhood by helping the poor and the hungry. “Medicina Solidale” (“Solidarity Medicine”) announced Jan. 12 that it is joining forces with McDonald’s and the papal almoner’s office, which gives the pope’s charitable aid to the homeless around the Vatican, to distribute 1,000 meals to poor men and women who often find shelter in and around St. Peter’s Basilica. Starting Jan. 16, volunteers from the charitable organization will distribute a specially prepared menu for the poor; it includes a double cheeseburger, fresh apple slices and a bottle of water. Lucia Ercoli, director of “Medicina Solidale,” said that the organization plans to distribute 100 meals a week for 10 consecutive Mondays. The program, she added, is “the beginning of a dialogue” with McDonald’s to expand in the future. “It is truly a small drop in an ocean of things being done by so many other associations, by so many people who spend their time helping others,” Ercoli said Jan. 12 in an interview with Vatican Radio. Noting her organization’s longtime collaboration with the papal almoner in providing medical care for the homeless, Ercoli said the new agreement will ensure that the poor also are provided with some much-needed nutrition. “With these meals, we’ll make a significant leap in providing so many women and men who live on the street in this neighborhood the possibility of a meal that will guarantee a suitable intake of proteins and vitamins for them,” she said.